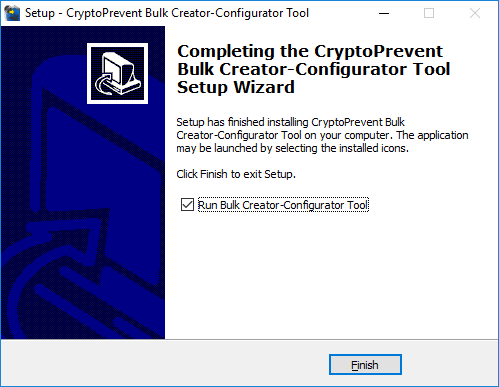 If there are any issues expanding the Bulk Creator Manual click here for the listed version or click here the single page version. 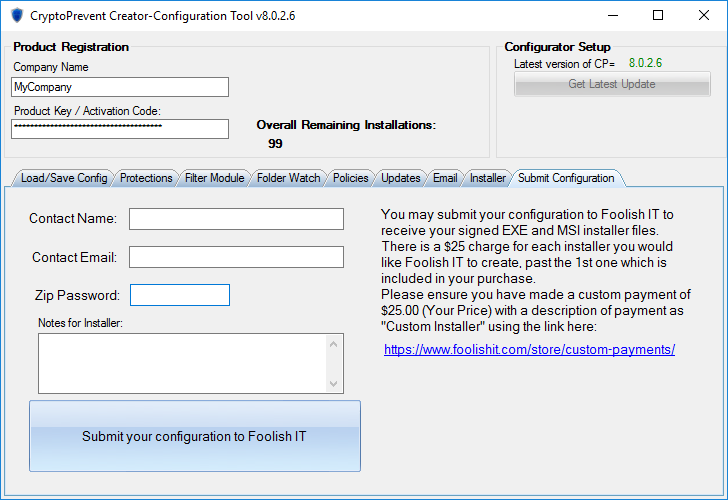 Click finish to close the installation and launch the tool. Uncheck the box shown if you do not want to proceed at this time. Please enter in your company name for purchase identification purposes and the product key that was delivered as part of your bulk purchase. Copy and paste your product key exactly as you received it. The key should automatically validate after a delay that may last for a minute or more. If the information was entered correctly and was validated successfully, the bottom portion of the tool will be exposed. The top portion of the tool’s interface shows the total number of remaining licenses associated with the product key previously entered. In the above example, 99 installations/licenses are available to assign to a particular configuration. Once installations/licenses are assigned to a particular configuration, they are reduced from your overall remaining installations. Installations/licenses may be retrieved from a configuration as long as they have not been deployed. 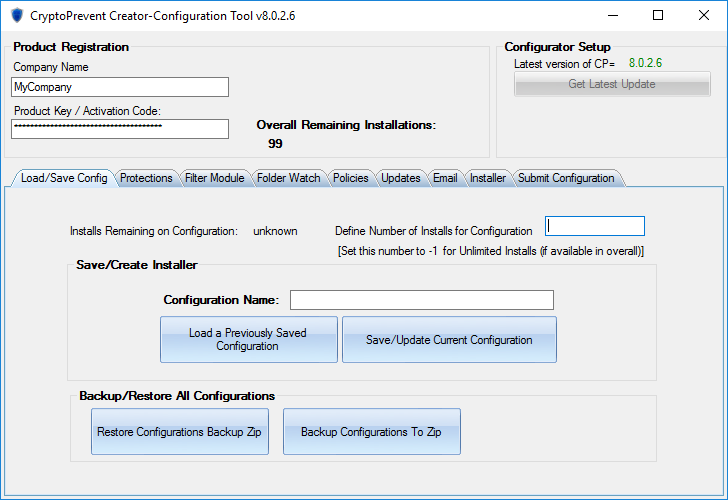 Placing a smaller number of installs than originally specified or a zero in the Define Number of Installs for Configuration field will increase your overall remaining installations. The loss of a configuration with installations/licenses attached will result in the loss of those installations/licenses. For this reason, we provide backup and restore buttons to safeguard your configurations. Please do not hesitate to frequently utilize those buttons. Assuming you have more than 0 “Overall Remaining Installations:” available. Software restriction policy path rules for the appdata folder, all folders beneath appdata, the “local” (as opposed to “roaming”) appdata folder, and the Recycle Bin. It also includes protections related to program naming, including blocking of double file extensions and exploits related to the direction of text interpretation. 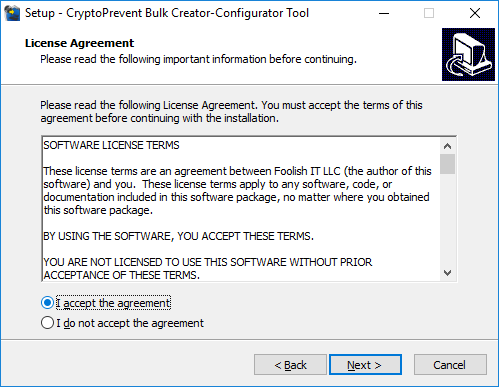 Software restriction policy path rules for the programdata folder, the user profiles folders, and the start menu startup folders. 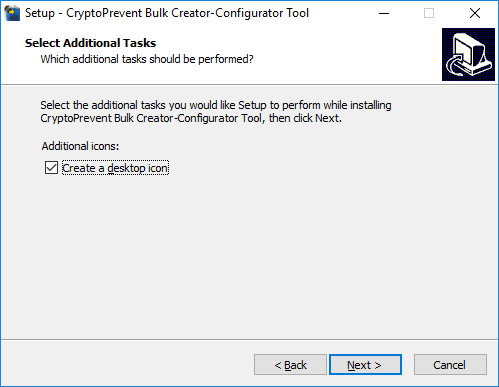 Three additional Windows utilities are also potentially blocked under this plan, vssadmin.exe, syskey.exe, and cipher.exe. 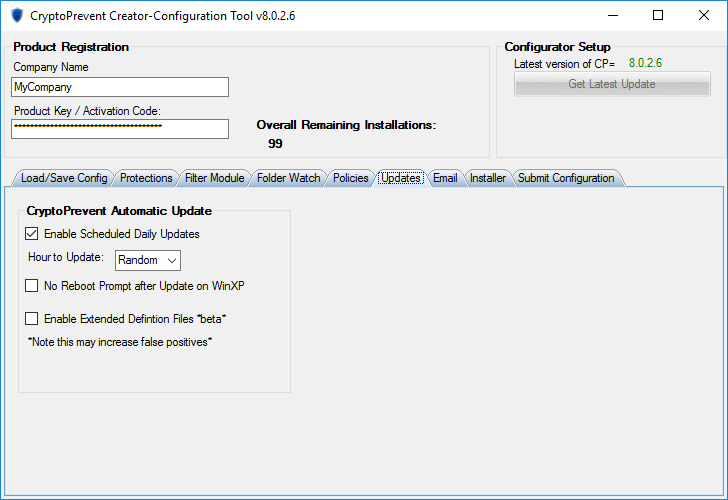 Please note that these are legitimate tools that have been known to be co-opted by malicious software. If you have no use of these tools and you do not use applications that rely upon them, you may safely enable those protections. The miscellaneous protections included in the Default plan will block some additional vectors for existing malware as well as the option to disable the use of legacy “Sidebar and Gadget” applications. The Block Windows Programs section will optionally prevent the use of the following Windows utilities: bcdedit.exe, wscript.exe, and cscript.exe. You may not want to enable this option because long login delays were reported when enabling this option in environments that utilize login scripts. can either selectively block certain executable file types or indiscriminately block them. The top three check boxes for the the .cpl, .scr, and .pif file types will check each files against our malware definitions and block them if a match is found. The lower three check boxes may be selected to always prevent the execution of the respective file types. 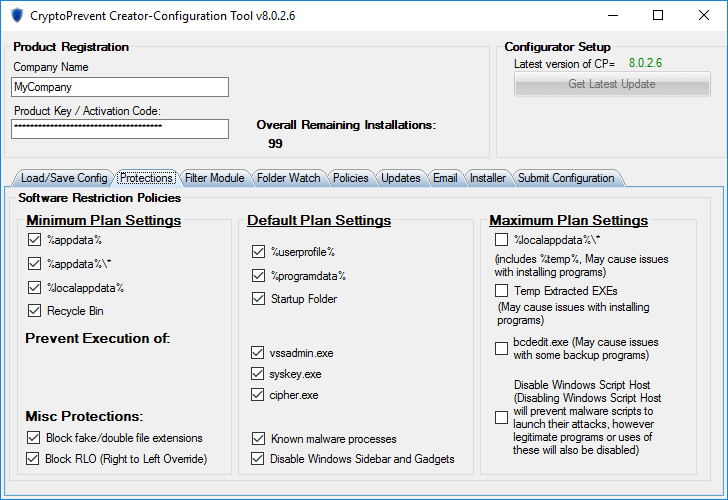 Program filtering for .exe and .com executables is always based upon definitions because preventing them always would prevent most, if not all, software from operating. The notification prompt settings on the right side only pertain to the .cpl, .scr, and .pif file types. FolderWatch provides additional monitoring of a selection of common folders and, optionally, custom folders. It is important to note that subfolders are monitored in the case of the predefined user folders but not in the case of custom folders. It would be necessary to individually add subfolders to the custom list in order for them to be monitored. 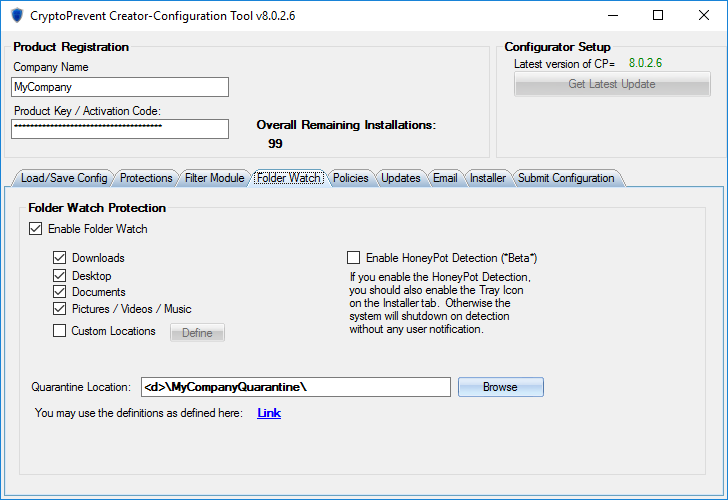 When activity is detected against these files, the HoneyPot feature will do everything in its power to prevent any further system activity, including slowing the system and only allowing it to be rebooted or shutdown. We provide a Whitelist EXEs already located in blocked locations upon install checkbox to simplify adding all existing items in blocked locations to the whitelist during client installation. You may predefine whitelist policies using the Define button. Feel free to add additional rules using the Define button to enhance protections for your specific environment. 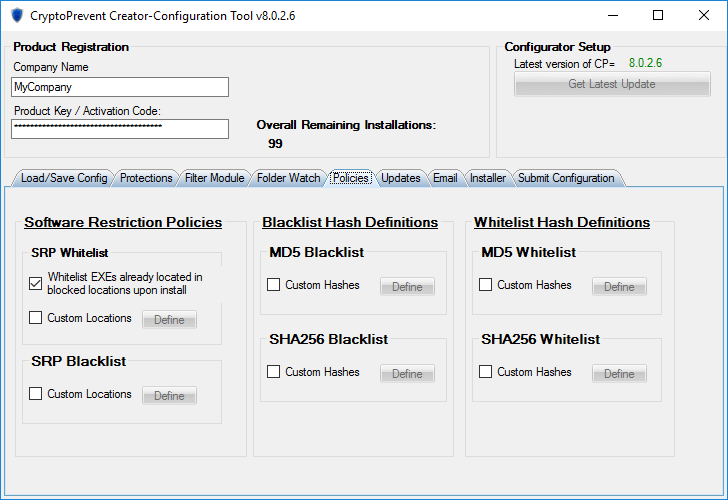 Use the various Define buttons to allow or disallow a hash, for the whitelist or blacklist, respectively to either remove a false positive or enhance protections over the base definitions. The updates tab allows you to enable a daily update schedule that runs at the hour of your choosing or at a randomly picked time. You may disable the reboot prompt for installation under Windows XP using the provided check box. Additional hash definitions will be downloaded from our servers if the Enable Extended Definitions Files *beta* option is checked. Alerts will be emailed using the provided credentials and options. Settings must be specified for every option except for email subject line text. 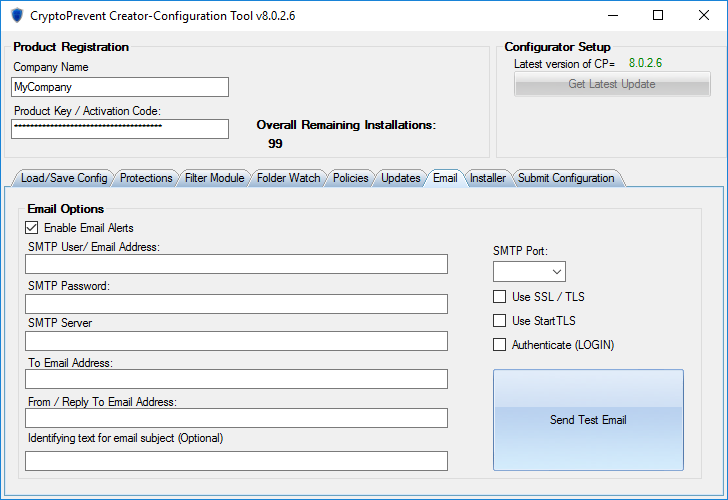 This restriction applies to any software that uses Google’s SMTP access and is not specific to CryptoPrevent. For example, Microsoft Outlook is affected by this as well. Please ensure your settings are correct by using the Send Test Email button. 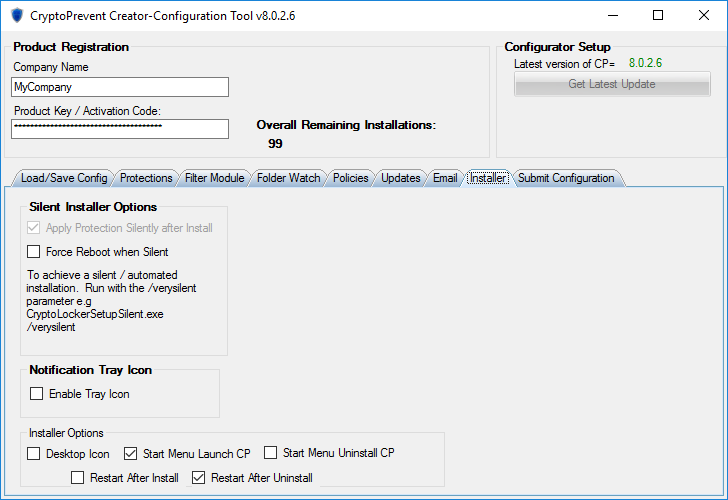 This tab contains various options relating to how the installer we provide functions. Please note that it is not possible to uncheck the option to apply protection silently after Installation with the bulk edition of CryptoPrevent. 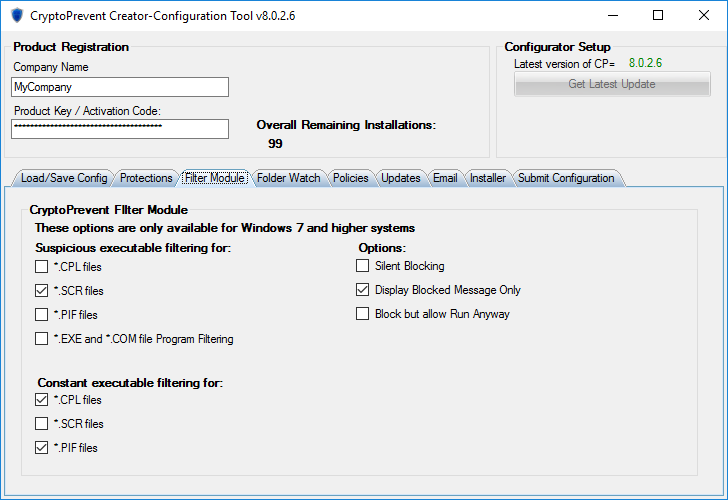 however, it is necessary to specify the /verysilent command line parameter to have a completely silent installation without the need of any user interaction. Additional checkboxes are provided for options relating to automatically launching the tray app for notifications, creating additional shortcut icons, and automatic restart preferences. This tab is used to submit your configuration to us. We will build you an installer upon reception of your settings. One of our staff will review each submission before completing your build. Any information you may wish to communicate to us may be placed in the Notes for Installer field. The name, email, and password fields for the zip archive containing your .exe and .msi custom installer are all required fields. The submission process requires access to port 465 for an SSL email connection, please ensure this port is open for CryptoPrevent if there is an error submitting your configuration. Please allow up to 24 hours for your installer to be built and delivered. Normally this occurs much more quickly during our normal business hours, 0900-1800 EST Mon-Fri.
Our offices may be closed and our staff unavailable on weekends and many federal holidays observed by the United States. Your custom installer contains your licensing codes. You are not authorized to make your custom installer available to any third party or provide a public link to your custom installer. Installations and licenses consumed by your custom installer are considered authorized by you. You will be responsible for all usage of your custom installer. If we believe your custom installer to be in violation of our licensing terms, we reserve the right to terminate the licenses and ban the associated codes. For additional assistance, please send all communications to sales [at] foolishit.com or support [at] foolishit.com for the fastest response.